After five years of dating Lisa is anticipating that all-important question, will you marry me? Impatient, Lisa decides to take matters into her own hands and propose to Matt, after all it is the 21st Century. Only she takes it one step further and with the help of her best friend Mandy, she prepares the ultimate proposal. What she doesn’t know is whether this will be the beginning of her happily-ever- after or the beginning of the end. The ebook is available now and you can read a free sample on Amazon. Read on for my review and a guest post from Rebekah. The Bulletproof Proposal is a sweet little story. Lisa has been waiting for what seems like forever for Matt to propose so, fed up of waiting, she decides to make it happen, with or without Matt’s knowledge! I read the story in one go and it was a real pleasure. It’s pure romance really and it was lovely to follow Lisa through her two week wedding planning experience. I was on tenterhooks at the end to see what happened and I wasn’t disappointed. Sometimes, with short stories, I find it hard to engage with them because there isn’t enough to grab me. This one wasn’t like that though, there was enough to get me interested and keep me wanting to read on. The characters are interesting and I thought it was a fun, sweet and heartwarming story. To say anything more would be to give too much away so you’ll just have to read it for yourself! I am very excited to share this post with you. As some of you will be aware, I published my latest book ‘The Bulletproof Proposal’ in November. This is my second book and I decided to write a novelette. I love the idea of a short story, the reader can enjoy it in one or two sittings, fitting it in around their hectic lifestyles. The idea for ‘The Bulletproof Proposal’ came when a close friend of mine was waiting for her partner to propose. I thought about what someone might do in that situation and I think most people would try and gain control, giving rise to the idea for my new book. This story was an exciting piece for me to write. I took on Lisa’s character with ease as she was fun to write about (I think I could also see some of myself in her). Authors will tell you to write about a topic that you would want to read yourself and this is a book that I would want to snuggle up with. I also love the cover, which I had great fun designing. I am guilty of choosing a book by its cover, so I hope it will attract you too. My wonderful husband put together the book trailer and I think it is a wonderful teaser of what’s to come. One of the things that I love about writing a story is the creativity that surrounds it. For ‘The Bulletproof Proposal’ I designed a mood board on Pinterest which allowed inspiration to flow and gave me some lovely ideas for when Lisa is planning her proposal. I also had great fun in creating a YouTube video trailer for the book. This isn’t something I had done before but I’m glad I did as I feel it brings the book to life and adds another dimension. If you’d like to check both these out please see the links below. 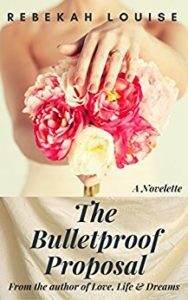 My hope is that you’ll enjoy reading ‘The Bulletproof Proposal’ as much as I loved writing it. Please leave a review if you liked it, on either Amazon or Goodreads, and tell your friends and family about it, it would be much appreciated. Thanks so much, Rebekah. What a gorgeous trailer. Rebekah Louise is 32 and lives with her husband and 3 year old son. Rebekah enjoys Yoga, walking and traveling. 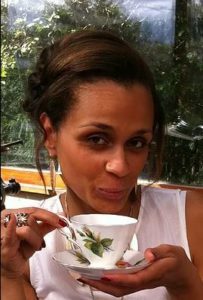 When not writing, Rebekah likes to read books by authors such as Sophie Kinsella and Jane Fallon. She also reads psychological thrillers (just to mix it up a little). Rebekah takes inspiration for her stories from everyday life, from the people she meets, to the conversations she overhears whilst doing her favorite activity – drinking coffee and eating cakes. Author bio and photo taken from the author's website. This sounds like a very nice little story to read during your vacation! Sometimes all we need is some sweetness! It is really lovely, Meggy. Great review and it’s always good to mix up the genres every now and again. Thank you, Cleo. Yes, it’s good to step outside my comfort zone sometimes.